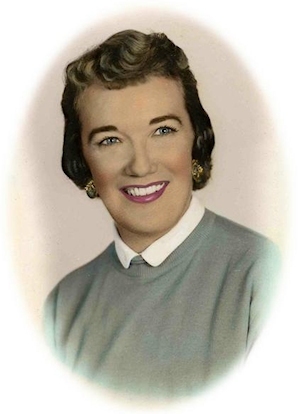 Obituary – Sewell, Patricia Ann (Jones) « Perry High School Alumni Association, Inc.
Patricia A. Sewell, 79, of Wichita, Kansas, formerly of Perry, Oklahoma, was the daughter of Frank M. and Elsie M. (Rueb) Jones. She was born on March 17, 1927 in Perry, Oklahoma and died Wednesday, March 22, 2006 at the Catholic Care Center in Bel Aire, Kansas. Patricia was a 1945 graduate of Perry High School. She enjoyed playing golf, sports and her dogs. Patricia was an Oil and Gas Land Lady. She was a member of the St. Rose of Lima Catholic Church and the Kansas Women’s Golf Association. A funeral mass will be 10:30 a.m. Monday, March 27, 2006 at the St. Rose of Lima Catholic Church. Father Tom Dowdell will officiate. Interment will be in the St. Rose of Lima Catholic Cemetery. Services are under the direction of Brown-Dugger Funeral Home in Perry, Oklahoma. There will be a family visitation from 6:00 to 8:00 p.m. Sunday, March 26, 2006 at Brown-Dugger Funeral Home. Memorials may be made to the American Cancer Society in care of Brown-Dugger Funeral Home, 1010 N. 7th Street, Perry, OK 73077. Patricia is survived by one nephew, Stephen Wilson of Irving, Texas; two nieces, Sarah “Sally” Landstrom and her husband Don, of Keller, Texas and Cathy Davis and her husband, Gordon, of Pampa, Texas; six great-nephews; three great-nieces; one great-great-nephew and six great-great-nieces.